Hey there! Thanks for dropping by Library Mom! Take a look around and grab the RSS feed to stay updated. See you around! Yay it’s Children’s Book Week! This event celebrates reading and books for youth. According to the official website: “Established in 1919, Children’s Book Week is the longest-running literacy initiative in the country. Children’s Book Week originated in the belief that children’s books and literacy are life-changers. In 1913, Franklin K. Matthiews, the librarian of the Boy Scouts of America, began touring the country to promote higher standards in children’s books. He proposed creating a Children’s Book Week, which would be supported by all interested groups: publishers, booksellers, and librarians.” So read to your children and encourage them to read! 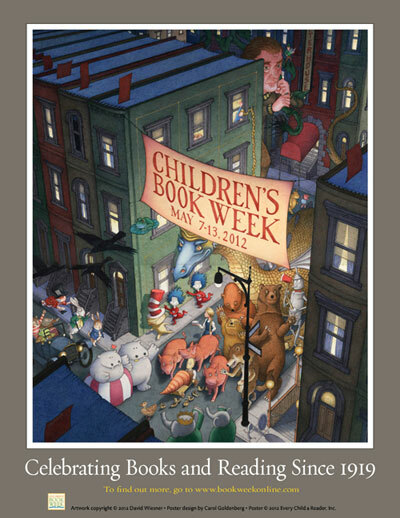 Below is the poster for 2012 Children’s Book Week, created by author/illustrator David Wiesner (who created the amazing book Flotsam which won the Caldecott in 2007). Check out all the classic children’s book characters he used! If you like the poster, you can order one for free (just need a SASE and check this link for more info). As you have gathered from my blog, I love to spend my free time reading children and young adult books, usually more than adult books. The Children’s Book Week website held a contest for the Children’s Choice Awards for the best books of the year. Here is a list of the books of the year and finalists. It is broken down in categories: Kindergarten – 2nd Grade, 3rd – 4th Grade, Fifth – Sixth Grade, Teen Book of the Year, Author of the Year, and Illustrator of the Year. I curious about most of the books as I haven’t read any in the first or second categories. I’ve heard Okay for Now by Gary Schmidt was good, as well as Racing in the Rain: My Life as a Dog by Garth Stein. I loved The Clockwork Prince: The Infernal Devices: Book Two and The Daughter of Smoke and Bone. Rick Riordan’s books are always a fun read, for both girls and boys (I tend to find myself gravitating towards books made especially for boys). I absolutely love Brian Selznick and his magnificently illustrated books, and I managed to get my mother to read both The Invention of Hugo Cabret and Wonderstruck, and she loved both of them as well. Thanks! I’m glad you like it. Come back soon!